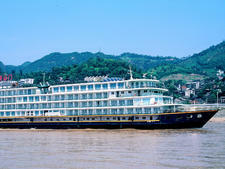 China-based Victoria Cruises launched Victoria Jenna in September 2009 as the largest river cruise ship ever built -- the line even put in a request to Guinness for more "official" confirmation. 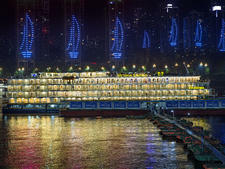 The 10,000-ton, 416-passenger vessel is almost 440 feet long, spans six decks and is roughly 50 percent larger than Victoria's next biggest river ship, the 6,200-ton, 308-passenger Victoria Anna. 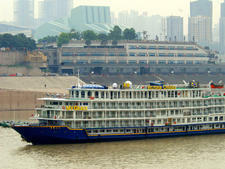 Victoria Jenna sails river cruises on China's Yangtze River, upstream and downstream between Chongqing and Yichang. All 208 cabins on Victoria Jenna have balconies. Standard cabin features also include bathtubs, marble-top bathroom counters, in-room refrigerators, safes, 26" flat-screen TVs (suites feature 42" TVs with DVD player), and international cable TV broadcasts of HBO and CNN. Standard cabins are 225 square feet. There are also three different kinds of suites. The three Executive Suites are each 320 square feet, 37 Deluxe Suites are 373 square feet and the two Shangri-La Suites are 633 square feet. Suite passengers have access to an executive suite deck with concierge service, as well as first dibs at reservations and complimentary dining at the VIP Club, the ship's alternative restaurant. On the dining front, there are two options. The main dining room, the Dynasty Dining room, can seat up to 350 passengers during a single open seating. 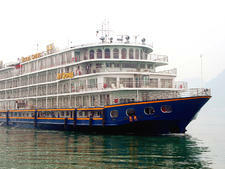 There's also an alternative eatery, quite a rarity on a river cruise ship, called the VIP Club. The venue offers a la carte dining, as well as omelet and egg stations for breakfast, noodle and sandwich stations for lunch, and carving and Peking duck stations for lunch or dinner (varies by day). Room service is available daily until 10 p.m. 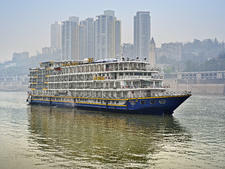 Onboard activities include destination-focused offerings like Tai Chi lessons, talks about the river's history, Mandarin language classes and mah jong. 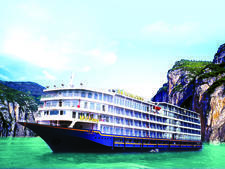 Additional onboard facilities include four elevators, a lecture room, library/reading room, cocktail lounge, beauty parlor and mini-spa, gift shop, observation deck, business center, and health clinic. The ship also features two dedicated conference rooms (equipped with AV-ready equipment for presentations) with capacity to seat up to 40 passengers. CDMA-based wireless Internet is available onboard.